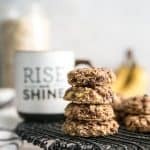 These Banana Breakfast Cookies are made with oats, extra ripe bananas, plant protein powder and gluten free friendly. Super easy, vegan and the perfect snack for kids too! Preheat oven to 350ºF and line baking sheet with parchment paper; set aside. In small bowl combine flaxseed meal with water; let sit for 5 minutes. In medium bow whisk together mashed banana, maple syrup and almond butter. Stir in flaxseed meal “egg” mixture and vanilla. Add in rolled oats, plant protein, cinnamon and baking soda; Mixture will be thick and sticky. Stir in mini chocolate chips. Scoop 2 round tablespoons and roll into ball; place evenly on baking sheet and flatten with slightly wet palm making as uniform as possible – cookies won’t spread. Bake for 8-10 minutes until edges are just slightly golden. Transfer to wire rack to cool completely.